Congratulations to the intrepid rebels that have reached max level and registered with the NPC in the job change room! This is the thread to post your stories and screenshots for the story of getting to max level contest! grats to the winners. surprised we don't a single 1-160 winner for thor??? That shouldn't be a problem. I believe most of us did the TIs at one point or another. 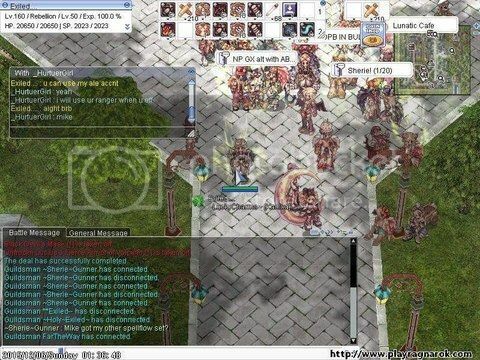 My interest in this game was starting to wane... thank you Paul Walker, for giving me another reason to play this amazing game of Ragnarok Online. Even after death, you are still giving so much. This one's for you Big Guy. After failed 3 times in jobchange test since she was so eager to kill all hunter cecils abandoning the direction by the instructor that she just need to kill the standard targets, finally she become a rebel. in this phase, she focus on doing low TI with absurd job level. After she finished sara's memory instance, she popped her first battle manual, she jumped 8 levels and got job level 50 at base level of 102. She just spammed desperado everywhere like a mad lady. 2nd battle manual: Turning in mid ti, eden quest, resetting TI, did another mid TI run. Turning in mid TI again, still have 12 mins, doing 1 set nogg road. Jumped from 108 to 115.
in this phase, she tried the new gatling gun called minigun and spam her first rebel skill called round trip and fire rain. she loved it and decided to use the skills until the end of time. she used it on mid TI, and eden quest to glast heim, nogg road, new world and other places to fulfill Gelkah and Rohtert's requests. thanks to round trip for fast killing rate, she jumped another 7 levels. 4th battle manual: turning in mid TI, malaya quests, resetting TI, did another mid TI run. Turning in mid TI again, still have 10 mins, spends all time grinding in mid ti. Jumped from 123 to 127. At this phase, she just stuck to mid TI continuing her role as exorcist and doing ghost palace instance to feel the dark past of Sakray. 5th battle manual: turning in high ti, eden quest, resetting TI, did another high TI run. Turning in high ti again. Jumped from 127 to 133. She did requests from Aigu to do search on Abyss Lake and Rachel Sanctuary while killing some monsters at the same time to complete the request of arrogant Melody Jack. She couldnt resist aigu since, well, nobody can resist her since Aigu always get what she wants. Also Medianna decided to do a complete module of malaya quests for big jump and access to their instances. Then she finished it using 2 rounds of high TI (this time, she must do it in party since she couldnt handle party pooper like kasa and salamander herself). Boom, enother big exp jump for her. 6th battle manual: turning in high ti, resetting TI, did another high TI run. Turning in high ti again. Jumped from 133 to 137. She just lazy to do some sidequest, so she only did jitterbug nightmare to claim exp from that cute baby Royal Guard, then stuck in high TI for the time being. 7th battle manual: turning in high TI, turning in scaraba BB, turning in eden quest, resetting TI. Did another high TI run. Turning in high TI again. Jumped from 137 to 142. She now decided to help Ragi to provides story for Aigu. She should kill bio2 monsters, scarabas and evil morocc incarnations. She got another big jump in levels by doing these quests. 8th battle manual: turning in high TI, turning in bio4 BB, resetting TI, did another high TI run. Turning in high TI again. Jumped from 142 to 147. She now able to join other big jumpers in bio4. She did a test drive of one round and combined it with 2 rounds of high TI. Thanks for Acolyte party for letting her in on his 30 mins bio4 party (well, i used my sorcerer also to help). 9th battle manual: turning in high TI, turning in bio4 BB, resetting TI, did another high TI run. Turning in high TI again. Jumped from 147 to 150. Hard to find bio4 parties, so she decided to complete eclage entrance quest as well as some eclage one time quests. after that, she decided to go back to high TI. sad since this was the last high TI for her. 10th battle manual: turning in hugel BB and grind the rest of the timer in clock tower. Jumped from 150 to 151. Now she can try nightmare clock tower for fast exp and it was very effective since the big bells had hard time to hit her since they kept pushed away. Oh, she also did some hugel bounty boards on odin temple and abyss lake. 11th and 12th battle manual. doing 2 rounds of Bio4. Jumped from 151 to 154. Glad this time she found bio4 party that wants to accept her (well, since i assist the party by using my sorcerer, Jin Akira). She got another good jump from doing 2 rounds of bio4 there. 13th, 14th and 15th battle manual. Turning in hugel boards, scaraba boards, eclage dailies, dimensional travel and spend the rest of manual in clock tower. Jumped from 154 to 156. Another hard time to find bio4 party, so she decided to hone her skills on doing hugel and scaraba bounty boards as well as doing eclage daily quest for decent exp, dimensional travel to prepare bios island, and spend the rest of timer and next 2 bmx3s on nightmare clock tower grinding. 16th and 17th battle manual. Doing 2 rounds of bio4. Jumped from 156 to 159. Glad she got another bio4 party (yeah, with assist of m sorcerer also) for delicous level jump of 2 rounds of bio4. 18th battle manual grinding in clock tower. Jumped from 159 to 160. At this stage, she refused to do bio4 and decided to finish her journey by grinding in clock tower. And hey, she finally made it. Edited by fuyukikun, 13 December 2015 - 12:14 AM. But congrats, was fun to watch. btw, does tempest do more damage compare to double peco egg minigun? hmm... since Thor still doesn't have a winner for 1-160 does that mean i can still try to make a new gunslinger to try to aim for that category also? and yehey i thought i wasn't going to make it to top 3 in Thor but i (Decay) did YES! I would like to thank "Necrohealiac" who told me in the other thread that it was 3 winners in the race for 99-160 in each server, i almost lost hope leveling up my Rebel when i saw the 3 160 Rebels in Chaos server. When the contest will end? So what was the prize. Yeah, I want to know the price is. BTW congrats to the other rebel winners. I actually made my char from level 1 Novice after the update. Thursday December 3rd around 10AM PST time. So maybe i'm in first place for the Characters created after Update category? Funny thing is that i wasnt even trying to be in any Top Rebel Category. Edited by Exiled, 16 December 2015 - 01:20 PM. Character create date in the DB = NULL character doesn't exist on Thor. Edited by Exiled, 16 December 2015 - 02:33 PM.